5 Diamond Blackjack Scratch Card Guide & Review - Casino Answers! 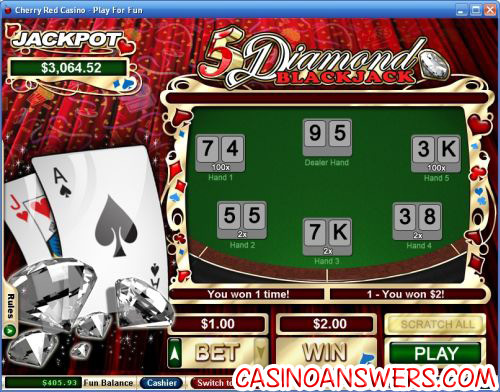 5 Diamond Blackjack is an online scratch and win game developed by Realtime Gaming, featuring a random progressive jackpot. You can play the 5 Diamond Blackjack scratch card game at USA-friendly RTG casinos Winpalace Casino and Cherry Red Casino. Bets on the 5 Diamond Blackjack scratch card start at $1 per game, but can be raised to $2, $5 or $10 per game. To start, all you have to do is select your bet and hit the “Play” button. You can either scratch the cards yourself (one click will do it) or hit the “Scratch All” button. The Scratch All button, however, is not really much faster than clicking each ticket manually. The rules of the 5 Diamond Blackjack scratch and win game mirror those of the game of Blackjack it is based on. You have two cards that must add up to higher than the dealer’s hand, without going over 21. There is no hitting or standing involved. If your hand equals 21, you will win double the prize. Ace is 11 and Royal cards are 10. Only one of your five hands has to beat the dealer hand in order to win at 5 Diamond Blackjack. You can win up to five times per game (referred to as a “Diamond” in the game). 5 Diamond Blackjack features a progressive jackpot, which at the time of this writing is at $3,064.54 and rising. The progressive jackpot is triggered at random and can be won on any scratch card that you play. Try your luck at winning the 5 Diamond Blackjack Progressive Jackpot at Winpalace Casino! Your prize for each hand is listed below your hand. If the hand is better than the dealer’s hand, you will win the prize listed for that hand. The payout schedule on the 5 Diamond Blackjack scratch-it game are as follows: Free Card, 1X, 2X, 4X, 5X, 10X, 20X, 40X, 100X and 400X. 5 Diamond Blackjack is an interesting concept for an online scratch card game. It doesn’t hurt that you get five chances to win and you can win a progressive jackpot at any time while playing 5 Diamond Blackjack. To play 5 Diamond Blackjack now, sign up and make your first deposit today at Winpalace Casino! How do I win on the Five Diamond Blackjack scratchie game? All you have to do to win playing 5 Diamond Blackjack is have one of your five hands beat the dealer’s hand in a game of Blackjack. The amount of your prize will be listed below your hand. Are players from the United States of America able to play 5 Diamond Blackjack for real money? Players from the United States can play the 5 Diamond Blackjack scratch ticket for real money at most RTG casinos listed on this website, including both casinos Winpalace Casino and Cherry Red Casino. How much can I win playing the Five Diamond Blackjack scratcher game? You can win up to 4000X your bet on the Five Diamond Blackjack scratch-off game. On the maximum bet of $10 per game, that would equal a win of $40,000. More realistically, if you play $1 per scratch card game, you will win $4,000. This is regardless of the progressive jackpot, which will also be in the thousands. How do I win the 5 Diamond Blackjack Progressive Jackpot? The Five Diamond Blackjack scratch card progressive jackpot is won randomly. It can be won on any game of 5 Diamond Blackjack, regardless of whether or not you receive a winning hand. Is there any Blackjack scratch cards online?